Lambeau Field, October 24, 2010. Photo by Mike Morbeck. Minnesota Vikings Pro-Bowl running back Adrian Peterson was indicted on charges of reckless and negligent injury to a child and a warrant for his arrest has been issued by a Montgomery, Texas, grand jury. 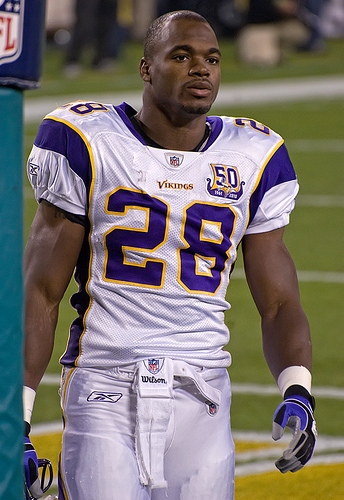 Adrian Peterson’s attorney, Rusty Hardin, said that Peterson used the same type of discipline on his child that he experienced growing up himself. Hardin stated that Peterson conduct “involves using a switch to spank his son.” Peterson removed the leaves of a tree branch, which Peterson referred to as “a switch,” to hit his child, according to a report by Sports Radio 610 in Houston. Hardin also told ESPN.com in a text that Peterson will surrender to authorities. Peterson has cooperated with authorities fully and also testified for several hours in front of a grand jury. Peterson referred to the incident as “a whooping” and also told police that it occurred in Spring, Texas in May. Peterson said it was punishment for pushing another one of his children. The boy suffered cuts and bruises to different areas on his body. The Minnesota Vikings are gathering information on the situation and have deactivated Peterson from Sunday’s game against the Patriots.